Contemporary art exhibitions engaging with colonial and postcolonial histories and practices are often wrought with the complex and contested weave of historical and national identities; cultural reclamation of legacies; and the future of nation-states. Southeast Asia, a collection of nation-states home to over 600 million people, is the cradle of deep and ancient civilisations. Yet, it is borne of colonialism and modernity, and therefore provides a fecund source of exhibitory possibilities. As Southeast Asian economies awaken in the twenty-first century, a fast emerging trend of curatorial adventurism is notable fostered by easy mobility of artists and collectors across borders; development of museums and galleries to showcase cultural wealth; emergence of highly collaborative and interdisciplinary artist collectives working across socio-economic strata; and the proliferation of archival and research centres to develop discourse and claim the past. While these add to the already contested weave of historical identities, they provide a rich and alternative source of engagement with contemporary art and artistic practices from an emerging region. Rich as they may be, as curatorial adventurism rapidly shifts from earlier practices of curating the known and antiquated in Southeast Asia to a systematic and ritualised act of curating the contemporary and new as a means of articulating new cultural representation of the region – these sources can be equally problematic in their own space. The exhibition, ‘Artist and Empire: (En)countering Colonial Legacies’, presents one such contested weave. Staged at the recently opened National Gallery Singapore (NGS) in late 2016, the exhibition is the second major international showcase at the NGS signposting the opening of Singapore’s grand ode to Southeast Asian art. Organised in association with Tate Britain, the exhibition was the international edition of Tate Britain’s ‘Artist & Empire: Facing Britain’s Imperial Past’ which ran in London from 25 November 2015 to 10 April 2016. The Singapore exhibition follows a common trope of international exhibitory principle: first, to stage international exhibitions to join the league of global and influential players such as the Tate and secondly, to situate NGS as a central engine of artistic discourse in the Asia-Pacific region by generating inquiries and providing a point of view from Southeast Asia. Drawing primarily from the main Tate Britain exhibition but providing a series of critical interventions through contemporary Asian artistic practices, the NGS curators nobly provide an innovative reading of artistic and aesthetics practices of and off the Empire.1 The opening wall text summarises the curatorial intent: ‘How did artists imagine the British Empire? Artists in Britain and its colonies responded in different ways to these developments. In turn their artworks also played a part in shaping public opinion about the Empire and its aftermath – the birth of new nation states.’ This play of and off, which looks at the colonial encounter through the lens of former British colony – Singapore, allows the exhibition to function as history’s timely alert to colonialism’s manifestation well into twenty-first century Southeast Asia. While much of twentieth century was dedicated to critically unpacking colonialism and its impact through culture and politics on nation-states, I allege that socialising with the colonial has become central to nation-states’ survival and independence as they struggle to provide for their fast rising and aspiring communities. But people forget and history erases. As such, this article studies the complicity of exhibition-making rather than curatorial agency in re-constructing, engaging and encountering a painful and problematic legacy and how it inadvertently normalises the density of colonialism as found in the staging of ‘Artist and Empire’ in postcolonial Singapore. Artworks are not neutral documents, capable of presenting facts or objective reality. Rather, they are subjective expressions of creative individuals with mindsets and values of a specific time and place. Just as artists’ worlds shape how they create art, their artworks, in turn, shape the way in which the world is perceived by others. That artworks are not neutral documents foregrounds a set of questions, concerns and opportunities to consider how more than two centuries of colonisation can be remembered and collated within a thriving contemporary art environment. My initial reaction was one of alarm upon hearing that this exhibition would be staged in Singapore. My first visit affirmed it. My dated late twentieth-century training in postcolonial critical theory was awakened: every conceivable critique could be predictably thrown at the exhibition to question its legitimacy. However, the curators, aware of the weight of history and critique that such an exhibition would attract, carefully and coyly prevaricated: the exhibition emphasised the neutrality of art and aesthetics and disengaged with the atrocities of the Empire. This remains the elephant in the room. But this neutrality is also specific to Singapore. I will return to this in my final argument. The opening section of the exhibition showcases images of historical figures and monarchy. The foyer of the museum welcomes the viewer to the statuesque Queen Victoria. Immediately, the exhibition’s opening image is one of Singapore’s founder, Sir Stamford Thomas Raffles. This reinforces a chilling condition of our present volatile times: The Last Man Standing. This verticality of figures (as overseers, explorers and conquerors) becomes a leitmotif throughout the exhibition articulating the power relationship between the coloniser and the colonised. The selected works emphasise this common thread only to be interjected by a Singaporean work entitled Artists Investigating Monuments – where a group of artists stand alongside the statue of Raffles – and works by artists from Asia, in particular, India where the traditional, be it royalty or subject, is often seated or bowed. I was particularly taken by the presence of the leitmotif in a large number of the works such that the hierarchy and reach of the Empire became visceral, thereby lending itself to normalising its impact. In this instance, the weight of colonialism far outweighed the artistic and aesthetic considerations inherent in each artwork. That remains a legacy of an exhibition such as ‘Artist and Empire’. From late 19th century onwards, there was great contact and exchange between Britain and the colonies, facilitated by technological advance, and ease of travel. These interactions were most evident in art education, patronage and circulation of artworks and ideas. 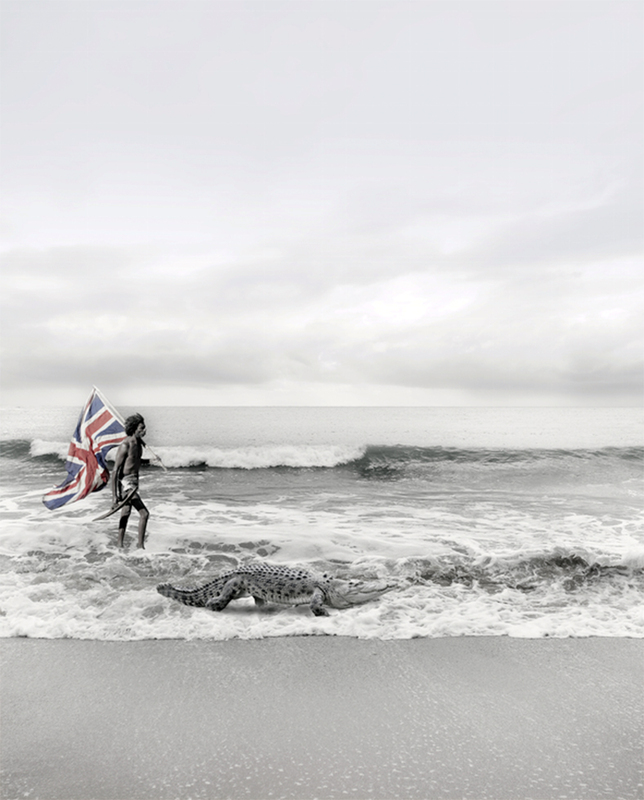 The exhibition normalises the flow of British cultural capital into the colonies. While the development of colonies did promote patronage and arts education, commerce and greed remained the cornerstones of the British and other colonisers in Southeast Asia. Erika Tan’s work at the Singapore exhibition is an eloquent intervention which critiques this by focussing on the lost and forgotten history of a Malayan weaver, Halimah Binti Abdullah who was brought to the British Empire exhibition in Wembley in 1924 to be part of the Empire’s showcase of its outreach, study of the native, and access to trade and the market. As the artist reveals, Halimah died in Wilsdend Hospital of pneumonia and never made her return home. Her weaving loom – now the collection of the V & A Museum – is the starting point of contextualising the weaving nature of the Empire and reminds us that the commerce and greed of the Empire transform into trade and foreign policy in the postcolonial era today. Artists have always been part of the colonial enterprise. Scholars have shown that colonial conquests often involved the scrutiny of the socio-cultural domain of a particular society through ethnographic drawings. Artists who followed Sir Francis Drake (1550–1596) helped map cultures and communities and contained the colonised into compositional frames while providing vital documentation for the mapping the territory. Moreover, the British East India Company’s business interests led to the critical documentation of life abroad for British citizens living in Asia. From flora and fauna, monuments to villages, to exotic new people and pride in the British conquest – this documentation was instrumental in world-making as we know it today; these later came to be known as Company Paintings.2 In most colonies, local artists were trained to further this project as the Empire became entrenched in the region. This method of inculcation, cloaked in the belief that it is indigenous, locally trained artists espousing a European style of art against an inherently rich and culturally specific art form that was already present. Art historian Geeta Kapur professeses that this inculcation ‘formed the academic criteria for and against which subsequent movements in Indian art developed’ and gave rise to a well-spring of artists such as Raja Ravi Varma (1848–1906) who mastered the artform and strove to raise Indian mythology in art to the level of Greek and Christian mythologies.5 Subsequent art schools established by Indians such as the Bengal School of Rabindranath Tagore revolted against this subjugation and engaged in artistic and aesthetic forms particular to Southeast and East Asia. Artists including Gaganendranath Tagore and Jamini Roy, whose works are featured in the exhibition, demonstrate the manner in which artists in Asia have problematised the relationship between tradition, colonialism and nationalism. However, it would be difficult to discount the potential for aesthetic complicity which may arise out of the early training that would have emerged from public art schools. The contemporary works invite us to counter historical worldviews, from the standpoint of today. As we view these works, we can ask what they reveal about the artist’s way of seeing the world. And how such ‘ways of seeing’ influence our understanding of contemporary life. I have argued in my earlier writings, that the founding of Singapore as a trading port in 1819 was not a site which attracted artists, artisans and craftsman.6 Singapore is an imagined space identified by the British to counter their geo-political rival in Southeast Asia, the Dutch, who controlled trade routes from West to East. The city state was purchased from the Sultanate of Johore and engineered to become a beacon of trade through the deliberate encouragement of economic migration from South India and South China. If at all, engagement with the arts is through the personal and grassroots interests of the various communities that were seeking to build a new port city. T N Harper, in his 1999 The End of Empire and Making of Malayan Culture, demonstrates that the British cultural policy explicitly sought to promote citizenship amongst migrants and to enrich Southeast Asia with a colonial legacy. This continued well into the last years of the colonial Empire and it became an imperative of decolonisation. Institutions such as museums, arts councils, festivals and arts societies were established to transform a cultural desert into a centre for cultural renaissance.7 In view of this background, Singapore – which is an imaginary of the British – can only propose a limited critical encounter with its colonial legacy. More fundamentally, Singapore does not share the same colonial narrative of conquest, subjugation and the rise of nationalism – seeking to overthrow the coloniser – as its neighbours and this sets the stage for a meta-purpose in its encounters with the past. History asks us: what manner of cause are we? Are we uncompromising, absolute, strong, or will we show ourselves to be timeservers, who compromise, trim and yield? Geographical location is Singapore’s lifeline. Caught in archipelago of islands its existential determination is through history-making and narrating histories of its making. I invoke Arjun Appadurai’s assertion that histories produce geographies and not vice versa.8 In this existential narrative, ‘Artist and Empire’ furthers the historical narrative in enshrining a colonial legacy for the existence of the city-state. It seeks to narrate a nation while demonstrating a deeply diverse and complex Southeast Asian environment. In placing a series of contemporary interventions by artists from Southeast Asia – Erika Tan, Wong Hoy Cheong, Lee Wen (Australia), Michael Cook and Simryn Gill – against British colonial artists: Abdullah Ariff and Chuah Thean Teng and the selection of works from Tate Britain, the exhibition challenges and acknowledges its complicit position. This provides an entry point for understand public institutions, such as the National Gallery Singapore, deliberating over contemporary art practices. One could argue that contemporary art practices resonate better with the aspirations of a future-looking nation rather than ideals of tradition and preservation, or for that matter, curatorial ambitions. Yet, as the Singaporean population ages, the ideals of tradition and preservation seep into critical discourse as museums, aspiring to carve a niche, become emblems of the past. While a young nation such as Singapore and youthful Southeast Asia continue to historicise from without, there is an urgency to contextualise and summarise from within so as to chart and own a cultural legacy, especially for an aging population in an imagined Singapore of the future. At the same time, concepts of national and cultural identity need to be crystallised for a young population that is more globally connected and locally distanced. I am reminded of Catherine Hall’s view that ‘a re-thinking of the British imperial legacy needs input from the “peripheries” for it would be very limited to re-think that history only from the “centre”’.10 In this regard, ‘Artist and Empire’ remains an overture from the centre, reinforcing Singapore’s own unfettered relationship to the colonial enterprise for its own legacy. The exhibition made for Singapore would reside, in Hall’s words, in the ‘mists of nostalgia’. Venka Purushothaman is an art writer, academic and arts manager. He is currently Provost at LASALLE College of the Arts Singapore. His research interests span art and cultural criticism, festival cultures and arts higher education. 1 The curators include: From the National Gallery Singapore – Low Sze-Wee, Melinda Susanto and Toffa Abdul Wahed and the Tate Britain – Alison Smith, David Brown, Carol Jacobi and Caroline Corbeau-Parsons. 6 Venka Purushothaman, ‘Cultural Policy, Creative Economy and Arts Higher Education in Renaissance Singapore’, in Roberta Communian and Abigail Gilmore, eds, Higher Education and the Creative Economy, Routledge, London and New York, 2016, pp 201-219.